We've put on our snow suits, we've strapped up our boots, and B is excitedly putting on his helmet. 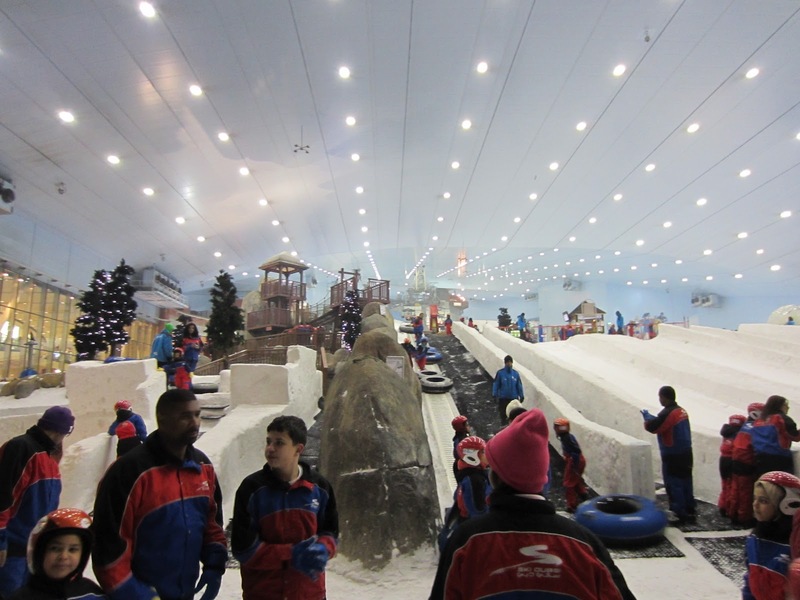 It's almost 100 degrees F outside the door of The Mall of the Emirates, and we are about to step into a world of snow. Everything about Dubai is larger than life, and Ski Dubai is just one of the attractions that makes the city a great destination for kids. With 5 ski runs for skiers and snowboarders, a freestyle zone, snow park, a quad chair lift, and two alpine-themed restaurants, there is lots to see and do. Even the most hard-core skiers (who might tire quickly of the short runs) would have a hard time not being 'wowed' by the sheer magnitude of this place, and the success to which Ski Dubai has created a mountain resort atmosphere in the middle of the desert. I wasn't feeling ambitious enough to get B onto skis, so we spent our time playing in the snow and zipping down the gentle snow tube runs. After having one of the warmest Toronto winters I can recall, it seems crazy we've had to travel halfway around the world to the desert to play in the snow. I had my hands full trying to pull B away when it was time to leave.